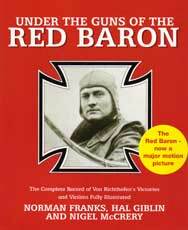 In the autumn of 2007, ninety years after this legendary fighter fell to earth, there will be a full length feature film released in the UK and Germany simply entitled The Red Baron, with Joseph Fiennes in the lead role. Manfred Freiherr von Richthofen was the most feared and celebrated of all German pilots in World War I, and has become one of the iconic figures of history. This book, by three respected historians, has researched in detail the lives of all of his 123 victims (over 100 of whom are depicted), and provides a blow-by-blow account of their encounter with the great man - a unique compilation of material.